Low land requirement (as low as 3 sq meters). How we got into vertical garden bags in Kenya is by accident. We were running a company (Real IPM; realipm.com) in Kenya and employed about 100 people in the year 2010. We had a staff canteen and provided lunch. We were concerned about their rather limited diet: many Kenyans just eat ugali (maize meal) and sukuma wiki (kale). As two horticulturists, we thought we could add variety and improve the nutrition of our staff by showing them different things to grow and eat. We had some spare land, and out of this developed the kitchen garden. However, our staff at home often did not have spare land to cultivate and therefore Louise began to develop ideas around the vertical bag garden. With a lot of trial and error a reproducible formula was developed for growing a range of crops in vertical bag gardens. What developed initially as an idea for our staff to take home soon began to generate external interest and people wanted to buy the bags. Some of the key components of the bags’ success are as follows. Bag material should be resistant to UV light. Recycled fertiliser bags will soon disintegrate. A local shade-net manufacturer was contacted, and today they are made of shading netting with a seven-year guarantee. 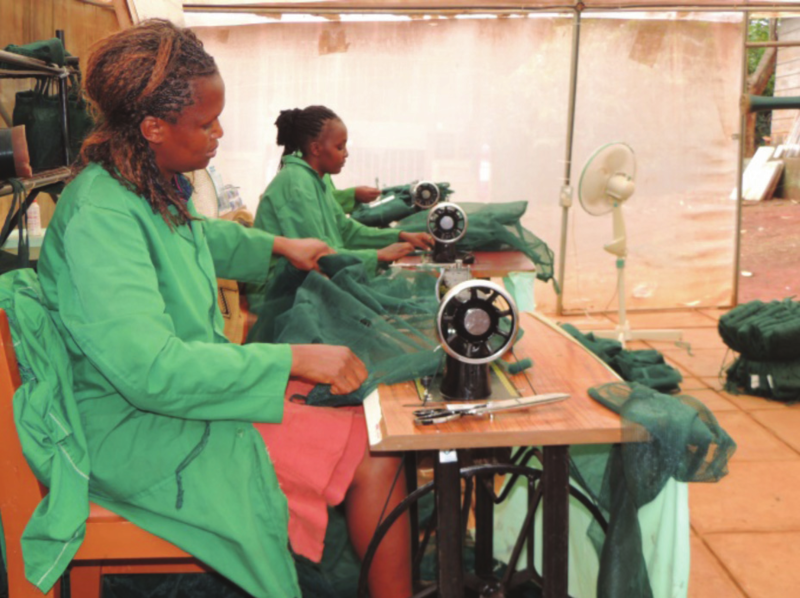 Currently we have three full-time seamstresses (Figure 1) sowing the bags to the various designs we sell. Getting the nutrition and growing media right. These bags will be producing leafy vegetables for seven to nine months, so getting the growing media right at the beginning is critical. Constructing and filling the bags so they remain stable and upright. This is definitely an art. Bag filling needs training, and an instructional booklet was prepared to show potential vertical bag farmers how to prepare their bags. This featured in an episode of Shamba Chef (Shamba Chef, 2017. Vertical bag gardens about two months since planting with drip irrigation system (Photo: Henry Wainwright). 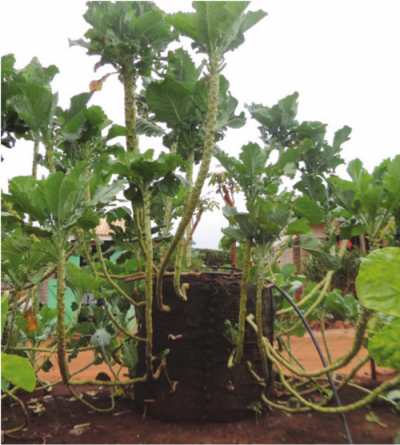 A 10-month-old vertical bag garden which has cropped 40–50 kale leaves per stem (Photo: Henry Wainwright). Seeing is believing. 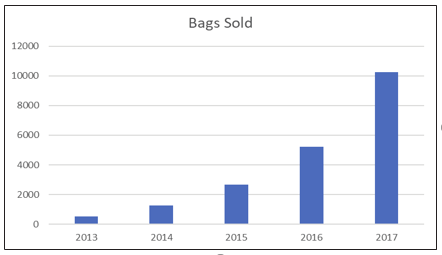 You can talk the talk, but the belief is when the potential bag farmer sees the productive bag. At our farm, vertical bags are shown in full production at various ages (Figures 2 and 3) all year round. 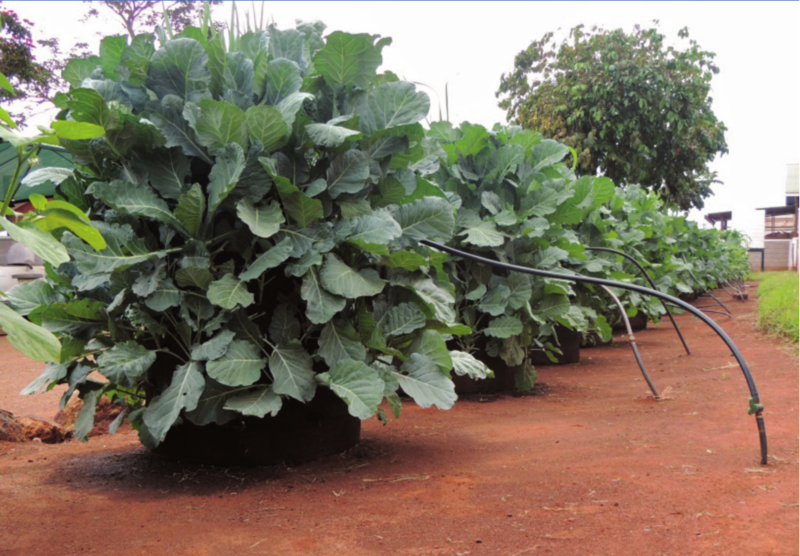 The crops suitable for growing on the sides of the bags are mainly leafy vegetables (eg spinach, kale, amaranth), while in the top of the bag the choice is much more varied. Interestingly, as we are on the equator, all sides of the bag perform very evenly as no side is shaded, unlike locations more distant from the equator. included growers buying 10+ bags to establish their own vegetable-growing businesses, and urban middle-class customers who buy a single, small, pre-planted ‘balcony bag’ they can put in the boot of their car and eventually place on their veranda. Read more about vertical bags on our website. Iam very greatful to you I have my fetch vegetables outside my rent house ,I hope many pple can follow ur advice and buy at least one vertical bag. Thanks for your feedback Patricia. We are glad the bags are serving you well. Grow and eat healthy veges.